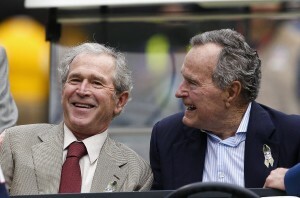 WASHINGTON — The alarm at former President George H.W. Bush’s Texas home was broken for at least 13 months before the Secret Service fixed it, according to a report released Thursday by the Homeland Security Department’s inspector general. Inspector General John Roth said Secret Service agents assigned to protect Bush noticed a failure in the alarm system at the former president’s Houston home in September 2013. A temporary alarm wasn’t installed until April 2014. Roth said the Secret Service used roving patrols and cameras to monitor the property while the alarm was broken and no intrusions were detected during that time. Bush’s primary home, which is permanently secured, is in Kennebunkport, Maine. Details of security efforts at the Texas home, beyond the alarm system, were removed from the public version of Roth’s report. According to Roth’s report, the Secret Service determined in 2010 that the home alarm installed in 1993 had exceeded its life cycle and requested a replacement, but the request was denied in August 2011. Limited upgrades were later made to the system, which ultimately failed by September 2013. Roth’s report said the agency is also concerned about security equipment at other former presidents’ homes. Their names were also removed from the public version of Roth’s report. Roth recommended that the Secret Service evaluate security equipment at the homes of everyone protected by the agency and take whatever action necessary to repair or replace the equipment. Secret Service told Roth that such a review was completed in January and a security system replacement plan has been included in the agency’s Resource Allocation Plan for the 2017 budget year. The report is just the latest in a string of security missteps and scandals for the agency responsible for protecting the president and former presidents. In September, a man armed with a knife was able to climb over a White House fence and run deep into the executive mansion before being apprehended. Lawmakers have been critical of the agency, including newly installed Director Joseph Clancy. In a statement Thursday morning, the top Republican and Democrat on the House Oversight Committee renewed that criticism.